With the 2016 Olympic Games kicking off in Rio de Janeiro in August, many athletes and their coaches are all in a twitter but not Zhang Chaoling. The chief coach of Egypt's national table tennis team remains unflappable, partly due to the fact that four of his players have already qualified for Rio, thanks to their outstanding performance at the All-Africa Games, the multi-sport event held every four years and regarded as Africa's pre-qualifier for the Olympics. Last year, at the 11th All-Africa Games in Brazzaville, the Egyptian women's doubles team fought back to beat Nigeria and clinch the championship. Zhang's joy turned euphoric when his players went on a winning spree, bagging the gold at the men's and women's singles as well. The winners automatically qualified for Rio. "I feel delighted with the results, especially the women's doubles team bagging the championship under very difficult conditions," a beaming Zhang said. "I am hoping the four would do well in Rio too." An Olympic medal would be a feather in the cap of the Chinese coach who came to Egypt nearly a decade ago. Zhang, who is from Xi'an, a historical city in northwest China's Shaanxi Province, was a child prodigy who began to play table tennis at the age of 7. He was selected to the provincial team at 13, and became coach of the Shaanxi provincial team when he was just 20. In 2008, the 44-year-old's table tennis career became laced with adventure. He was invited by a table tennis club in Cairo to coach Egyptian players and accepted the offer with alacrity to follow his "ping-pong dream." "Table tennis is my destiny," Zhang said passionately. But when he arrived in Egypt, things were far from smooth. The first major hurdle was the language. Zhang could speak neither English nor Arabic and so, couldn't exchange a word with the people he lived and worked with since there was no interpreter. He gritted his teeth and began to learn Arabic by himself. Starting from the simple words he needed for the daily lessons - such as racket, table, serve and smash - he began to pick up words and phrases he heard people around him use. The other Egyptian coaches, players and Chinese living in Egypt, even the vendors in the local clothing markets, became his teachers. "I would write down every word I heard in my notebook and ask the players in my team to teach me how to pronounce it," the jaunty-looking man with a crew-cut and in all-sports gear, described his early-day woes. "One year later, I could communicate with the locals in a basic way." As a foreign coach, Zhang made a lot of effort to gain recognition, guiding his players with unwavering patience, and watching every gesture they made at play like a hawk. The dedication bore results and in the course of time, he developed a strong rapport with his teams. Soon, he had a new honorific title. The players and other coaches began to call him Zhang ge, which means "big brother Zhang" in Chinese. One day, the players and other coaches surprised him by greeting him with a cake almost the size of a table tennis board. He had forgotten it was his birthday! The gesture touched him so much that it made him want to cry. His ability was soon recognized by the Egyptian Table Tennis Federation (ETTF) and in 2014, he became the chief coach of the national team. Since then, he has introduced advanced technologies, greatly improving the skills of the players. Zhang said he also gets huge support from ETTF President Alaa Meshref, who, being born in a table tennis-playing family himself, understands the game and listens to Zhang's suggestions. On Zhang's advice, the ETTF constructed a new, well-equipped gymnasium where the players can train. Zhang thinks the Egyptian teams' current good performance would not have been possible without this support. Meshref's daughter Dina is a prized student of Zhang. She is the current Egyptian women's champion who bagged the women's singles gold at the International Table Tennis Federation African Cup tourney in Khartoum. Zhang wants her to play in more international tournaments. Though Egypt has become a table tennis super power in Africa, it's not enough for Zhang. He wants Egyptian table tennis to be world-class, like China. In the first half of this year, he led his players to tournaments in Singapore, Hungary and Germany to improve their psychological as well as physical stamina. Another way of doing that is by making his players train together with Chinese peers in his hometown in China and take part in Chinese tournaments. 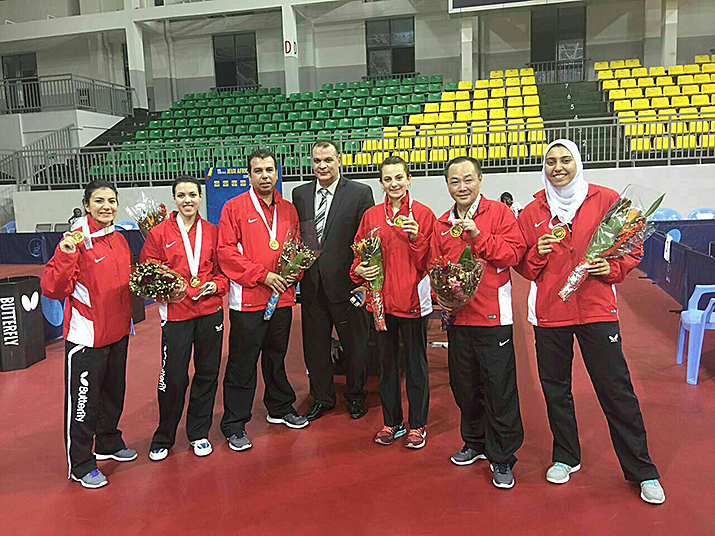 The Egyptian team has taken part in the China Table Tennis Club Class A League Series tournament for three years in a row now, netting a harvest of medals. To ensure medal tallies at tournaments as well as cultivate young players, Zhang plans to have Egyptian youngsters take part in the National Children's Table Tennis Competition in China. According to Zhang, China's table tennis world champions were groomed young, usually selected from children's competitions. Chinese world champions such as Wang Nan, Zhang Yining, Ma Lin and Wang Hao all prove the effectiveness of the "catch 'em young" philosophy. "Egypt will also become a power in table tennis if we can cultivate skilled players when they are young," he said. Zhang hopes players from the two countries can learn from one another. "China is known to be a world power in table tennis. Egyptian players can learn a lot from us," he told Beijing Review . In Africa, table tennis has developed in an unbalanced way. Except for Egypt and Nigeria, it is relatively undeveloped in other African countries due to their underdeveloped economy and training system. Besides Egypt, several African countries, such as South Africa, Nigeria and Tunisia, once recruited coaches from China. Zhang hopes to set up a Chinese table tennis association in Egypt to strengthen table tennis exchanges with China and promote bilateral ties. Zhang says Egypt has become his home. "I will stay here," he told Beijing Review. "I love Egypt and there is a deep bond between my players and myself. Egypt must become one of the strongest table tennis teams in the world."